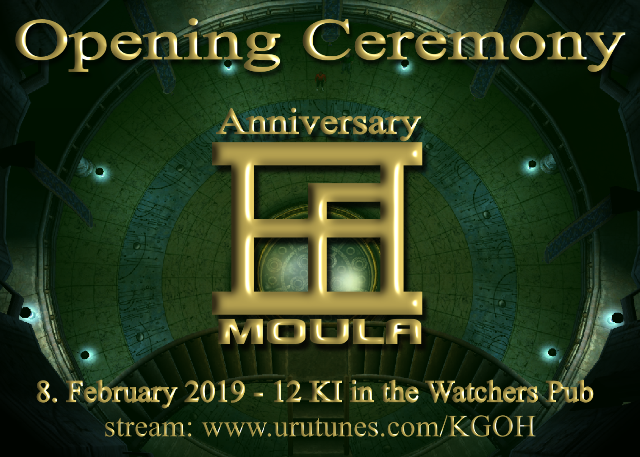 We're celebrating the 9th anniversary of MOULa! You are all cordially invited to the events. It's a tradition. Ghaelen D'Lareh will hold the Opening Ceremony. We all love their wonderful voice. We meet at the Watchers Pub, accessible via the Nexus. 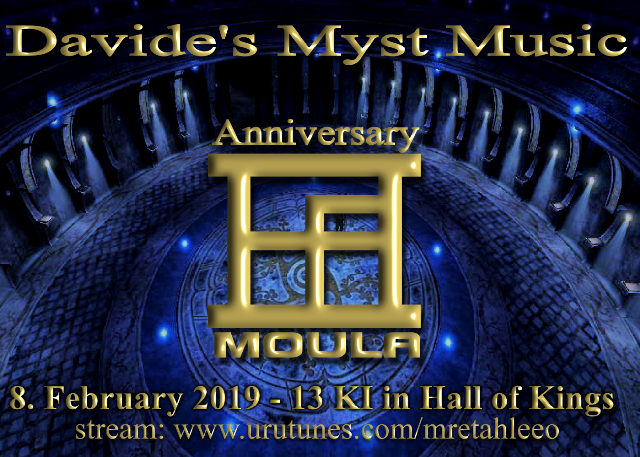 We meet in the Hall of Kings in A'egura to hear Davide's Myst Music. You need to open Urutunes in your browser to listen. We meet in the cleft by the campfire. 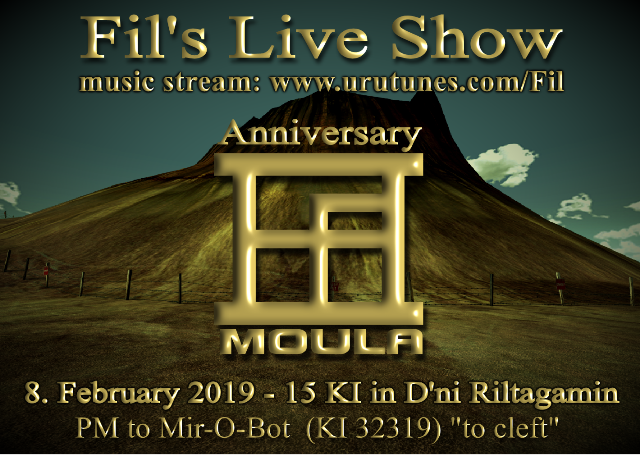 Fil excites us with his great voice and guitar playing in a live broadcast. The Nulp Dance Group invites you to their 8th show. You need to open Urutunes in your browser to listen the music. 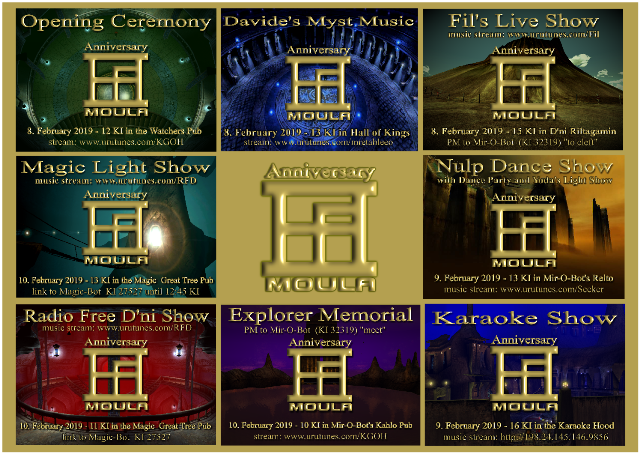 Did you know how many wonderful singers we have in MOULa? 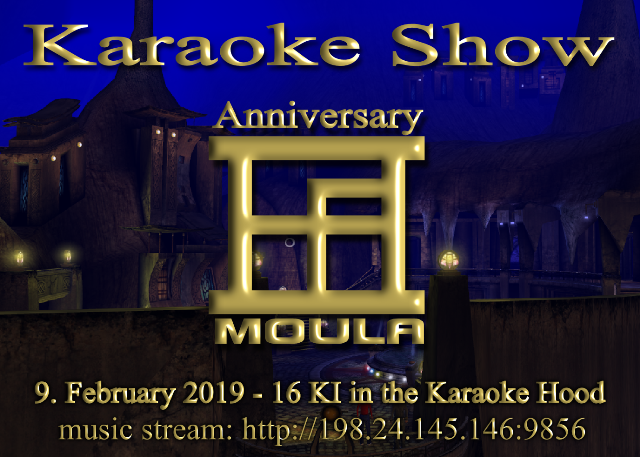 You should not miss the Karaoke Show with DonahooDJ. We meet in the Karaoke Hood accessible via the Nexus. Because the slots will not be enough, Seeker will complement Donnahoo's stream. Ghaelen D'Lareh will traditionally hold the commemoration of our deceased explorer friends. 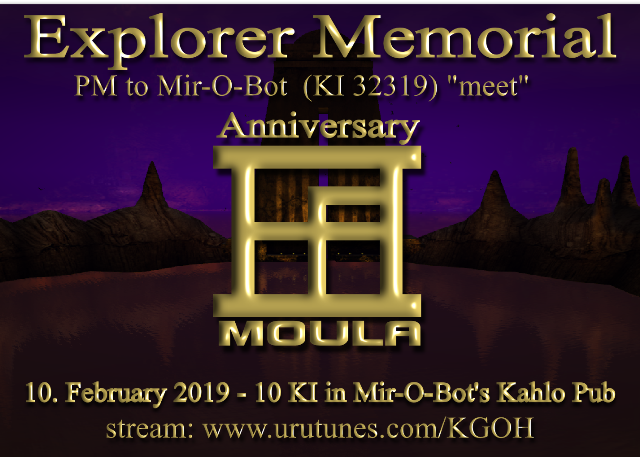 Because of the beautiful ambience and the flowers, we will meet in Mir-O-Bot's City at the memorial column in the Kahlo Pub. PM meet to Mir-O-Bot (KI 32319) - With PM to Mir-O-Bot auraon you get a nice light. 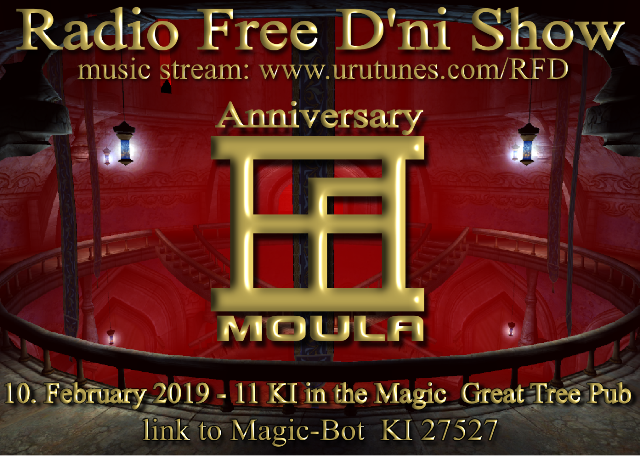 Radio Free D'ni will entertain us with music. You have the opportunity to dance. We meet at the Magic Great Tree Pub. 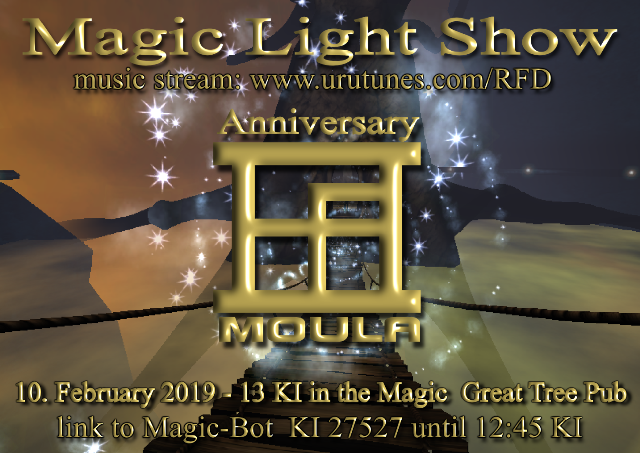 Mister Magic completes the 9th anniversary of MOULa with a Magic Event and Yoda's light show. We meet in the Magic Great Tree Pub. Please arrive punctually until 12:45 KI to see all the effects. Last edited by Minasunda on Sun Jan 20, 2019 9:21 am, edited 2 times in total. I'm DEFINITELY going to be there for this! 100 times checked and still overlooked. I change it immediately. 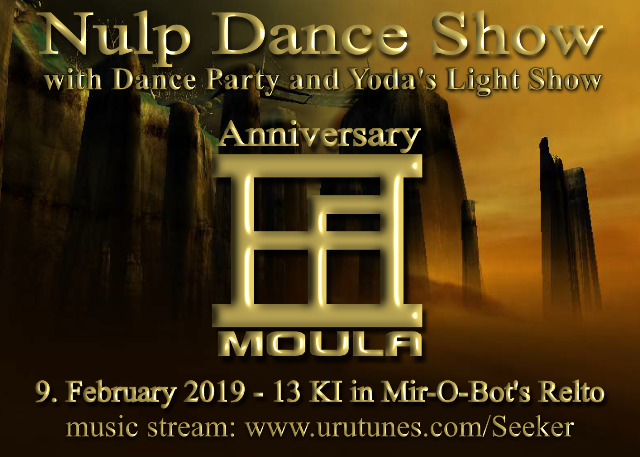 We will swap presenters after the RFD show as Ed will mix the show itself but I will be playing the music for the light show and the dance party afterwards. This may mean that you will have to restart your browser or music player. We try to make the changeover as seamless as we can, but sometimes the stream drops for just long enough to upset some computers. I hope many players will find their way to the cavern too!